While I don’t mind getting a tan, I do not like the discomfort sunburnt skin comes with, so I religiously slap on some sunblock whenever I know I’m going to be exposed to the sun for long periods of time. 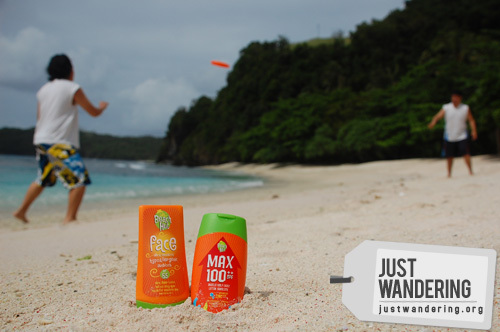 Luckily, the good people of Beach Hut Philippines sent over a couple of their new products for me to try out: Beach Hut Max SPF100++ and Beach Hut Face SPF65. Both bottles have an icon that says “prevents skin darkening” at the back, which I’m sure would appease most Filipinos who are afraid of getting dark. However, I must have used the sunblock wrong because the first thing out of my friend’s mouth when she saw me after the trip to Bicols was “wow, you’re so dark.” But yes, sunblock. It’s good for your skin. If I know I’ll be anywhere near the water or going to ride a boat, I make sure to bring my Rubber Ducky dry bag. Or at least plenty of zip top bags for my gadgets. Rubber Ducky is available in Stoked stores. You can also try Sea to Summit, who offers lightweight dry sacks that takes up very little space. Sea to Summit products are available in R.O.X. and Travel Club branches. Of course, if I’m island hopping or snorkeling, having an underwater camera is a must. While there are a number of cameras that are water proof, I’m stuck with my current point and shoot and an underwater pouch. The Dicapac has served me well, though now I must admit that I’m considering getting one of those underwater cameras because it’s hard to change settings when the camera’s inside the pouch. Still, it does what it’s supposed to do and I’m pretty happy with it. Dicapac is available at JT Photoworld. Oh how I miss days like this. It’s almost a travel cliché, but you have to admit, sarongs are the most versatile item you can have in your backpack. It can serve as a towel, a skirt, a dress, a blanket, a bag or anything you can do with a piece of cloth. While everybody else take their travel photography like it’s very SRS BZNZ, I prefer to take it easy and take crappy shots. Still, it’s great to have a tripod with you for those long exposure shots. Lazy bums like me who can’t be arsed to tote a tripod around revel in the Gorillapod. It’s a tripod minus the bulk and is an instant conversation started. Joby Gorillapod is available in most photography stores in Manila. Watch out for the fake Gorillapod though! Growing up in the Philippines means wearing your tsinelas when you’re at home and when you go out to play with the neighbor kids. It’s just so darn comfortable to wear and it keeps the sole of your feet from touching the grimy bathroom tiles of the hotel’s communal shower. I actually use the pillow at home too. Perfect for propping my iPod arm up while lying down in bed. I used to scoff when I saw these pillows years ago. Why would I bring something so bulky to a trip? The inflatable pillow is enough for me, thank you very much. Of course, that’s before I decided to buy one and realized why traveling with one makes the world a much better place (well, not really). Inflatable pillows cannot hold a candle to an actual pillow. Neither can the lumpy, hard and flat (take your pick) hostel pillow. It also prevents your head from lolling about too much when you’re sleeping in the cramped minivan. My travel pillow is Muji. It’s now available at the local Muji stores for Php 1,425. How about you? What’s in your backpack? Ehem! Ikaw din diba? Hahaha!!! Chyng, teh! Papagawa din tayo nyan don’t worry!!! Nice! I always bring the Sea to Summit dry bag during my hikes. BTW, what’s a fake Gorillapod? I bought one in Park Square, a bit pricey for Php500 and it’s small too. Looks like the one you have, but now it’s broken. How can I tell if it’s a fake? 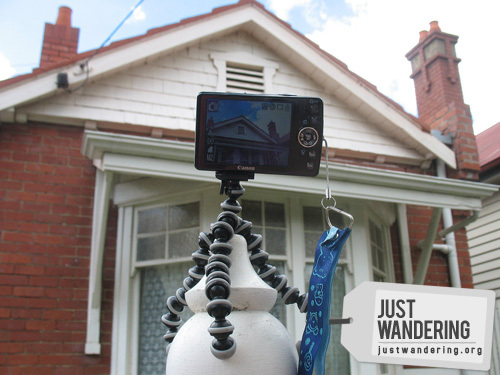 The original Joby Gorillapod has very tight joints; you need some effort to bend the legs. The fake one though is very pliable and the rubber is smoother. I remember I bought my Gorillapod for Php 1,400 before. Flashlight, ziploc bags, wet wipes, water bottle, antihistamine. Dry bag sounds like a good idea. Must get one. Thanks! Awesomes. I always have medicine no matter how long or short the trip is. Pain killers and immodium is a must hehe just in case! oh yah and bandaid and hand sanitiser! I also always bring my Muji passport holder. I tend to shove all my travel documents in there and a copy in my bag just incase! I could never travel without a good book for those long rides and flights. And I do need a sarong now. Such a pretty but practical thing to have in your travel pack. You’ve seen my giant maleta. I’m sure you’d agree. wala ako nyan lahat so penge!!! hahaha like ko yung sunblock at yung dicapac ba yun, sana my magbigay, ehem, at sana my ksama ng underwater cam! Money po… yun ang diko ko iiwan… pero di naman marami… sakto lang..
good list of stuff here, the dry bag is a must…but how much is that rubber ducky? is it expensive? Thanks Calai! 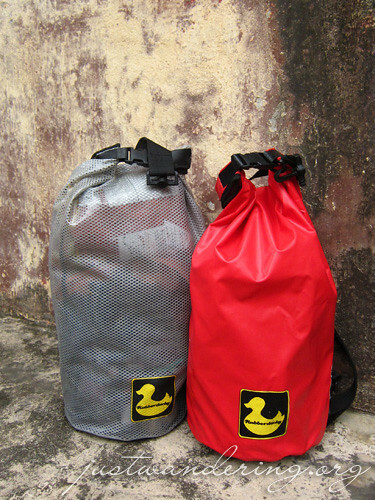 That large Rubber Ducky bag costs about Php 800. Sea to Summit costs around the same, but I think it’s for a smaller size. 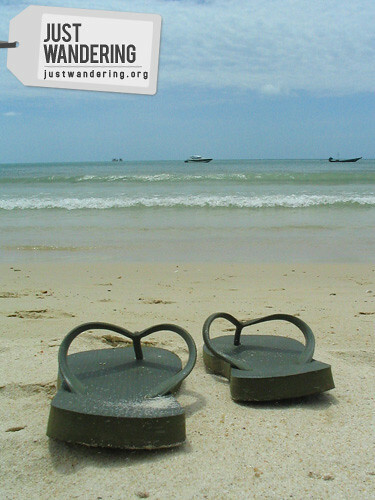 This post has just made me realise how inadequate my backpack will be when I head out to less comfortable places. I really need to start stocking up. I saw that pillow in MUJI and couldn’t resist! 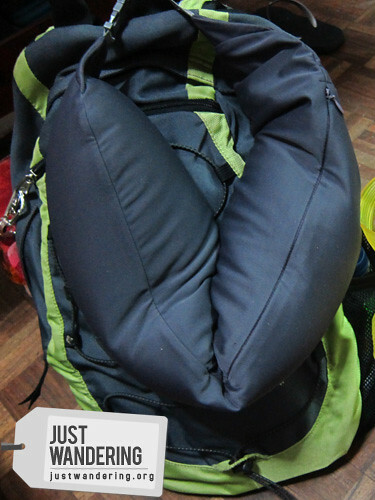 Have you seen the drybags being sold at Sandugo? Its around half the price of the Ducks, but I’m not sure if the quality is at par with it. Good job with the rubber ducky dry bags. Notice that even if the Philippines is a tropical country, it experiences A LOT (and I say, A LOT) of rainy days; hence, the importance of the dry bag. And yep, safe for boat rides. Wouldn’t have to worry about our cellphones getting wet. Indeed it is! Zip-top bags also work, but they’re not as durable.